In May 2015, Ireland became the first country in the world to introduce marriage equality by a vote of the people. The momentous 62% “Yes” vote was a result of the most extensive and effective civic campaign ever seen in Irish politics. The digital campaign created a network of community voices across the country to further build positive social and cultural change. It enabled and supported active citizenship and participation across all sectors of society. We learned some important lessons during the Yes Equality campaign. Whether you’re building public support for an international cause or one at home, here are five ways we achieved real change with our campaign. For us to win as a minority, we needed to build a majority. This required establishing and maintaining a positive tone throughout and to manage control of the message, particularly online. We needed to create a campaign that people wanted to be a part of to reach and persuade the “movable middle”, whose votes would decide the outcome. Yes Equality played a part in moderating the tone of the debate and coverage on social media, encouraging its supporters towards positive messaging. By creating content and responding to online developments, Yes Equality set the upbeat and respectful tone of the debate. A key tactic of the Yes Equality campaign was to make the case for marriage equality by telling personal stories. Research we conducted showed that when you talk to family or friends about why the rights of lesbians or gay men to marry is important to you, it helps persuade them to vote Yes. These stories resonated with people and helped start conversations, change hearts and minds, build bases of support, generate donations, and inspire action. Memes featuring quotes and images of high-profile Yes supporters performed extremely well on social media and became a staple of the positive and shareable content of the campaign. Memes featuring Irish singer Daniel O’Donnell and former Irish president Mary McAleese were among the best-performing content during the campaign. In the months leading up to the campaign, the small campaign team in the Dublin Headquarters knew that there was no way they could win this alone. We set out to build a grassroots network across the country and soon over 60 Yes Equality groups had emerged. The vast majority had an active presence on social media throughout. Facebook, Twitter and WhatsApp were instrumental in providing the tools required to guide supporters and activists towards action and to facilitate local campaigns. Twitter was used to recruit new volunteers, WhatsApp groups were created to keep members updated on canvassing activity, and Facebook helped in promoting fundraising efforts around the country. While the campaign nerve centre was in Dublin, and a central team provided strategic leadership and oversight, Yes Equality was keen from the outset not to seek or maintain control. Instead it focused on building capacity and resourcing groups and individuals to run their own campaign. 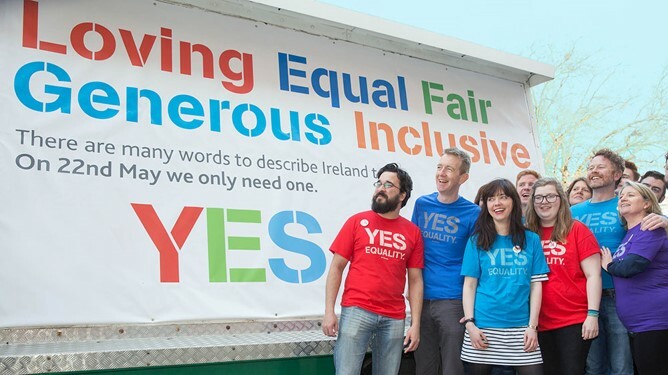 That said, it was paramount that the Yes Equality content and messaging be consistent, compelling and relevant across all platforms and sub-groups. Sub-group coordinators signed a protocol document agreeing to what was expected when using the Yes Equality name and brand. Campaigns must create a space that encourages and helps supporters to create their own content. Authentic campaign messages from supporters to their networks can reach more people and incentivise more action. During the marriage equality referendum, Vote With Us created a format and platform where people could share why they were voting Yes and ask others to do the same. Perhaps the most powerful contribution came from Brighid and Paddy, a couple from Dundalk, Co. Louth, who were married for 50 years, are practising Catholics, and wanted to spread the message that everyone should “have the opportunity to experience the love, protection and companionship we have experienced”. Social media gave Yes Equality a platform to respond to news stories, issues and online developments as they arose. The emotive nature of the referendum campaign created much media debate and occasional controversy. Yes Equality often needed to respond swiftly and adapt appropriately. For example, when the opposing side erected their posters there was frustration and anger among Yes supporters, with a few tearing them down and posting photos of the results on social media. Yes Equality responded immediately on its social media platforms to condemn the removing of posters by supporters on either side. It harnessed the frustration by sharing links on social media encouraging people to help fund the Yes poster campaign. This resulted in a surge in donations. Get insights, best practice and examples of innovative, exciting campaigning on our campaigning hub. Craig Dwyer is a digital campaigns and communications consultant and was social media director for Yes Equality during the marriage equality referendum. He is also the founder of ForaChange, a free online resource for campaigners and activists.